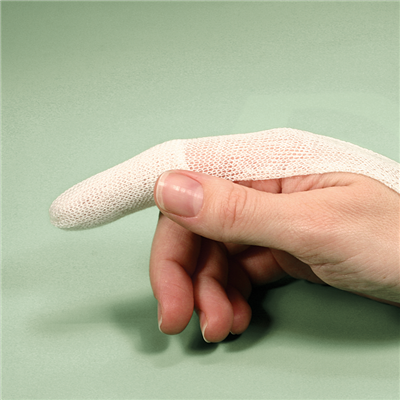 Common finger and toe injuries include bruises, cuts, torn nails, or jammed fingers. Bruising and swelling is usually caused from the soft tissues and underlying bones (falanges) being smashed or hit. Finger and Toe Tube Gauze Bandage provides optimum finger and toe protection. It is ideal for the protection and treatment of toe and finger injuries, as well as for blisters, burns, cuts and stitches. The tube gauze is very easy to apply and just slides over the affected digit. It is ideal for holding dressings in place and for the secure protection of finger and toe injuries. It is quick and easy to apply and can be used on closed finger or toe bandages or for more support as a finger stall. The bandage is made from a blend of cotton and viscose. There is no need for clip fasteners or adhesives with this bandage.